This square is 3000 m2 and made of asphalt, including 800 m2 of ground asphalt. The asphalt mixture is composed of Limoges porcelain (famous French porcelain) that gives a light & aesthetic finish. It is divided into two: a pedestrian path made of ground asphalt and a driving path made of shot blasted asphalt. 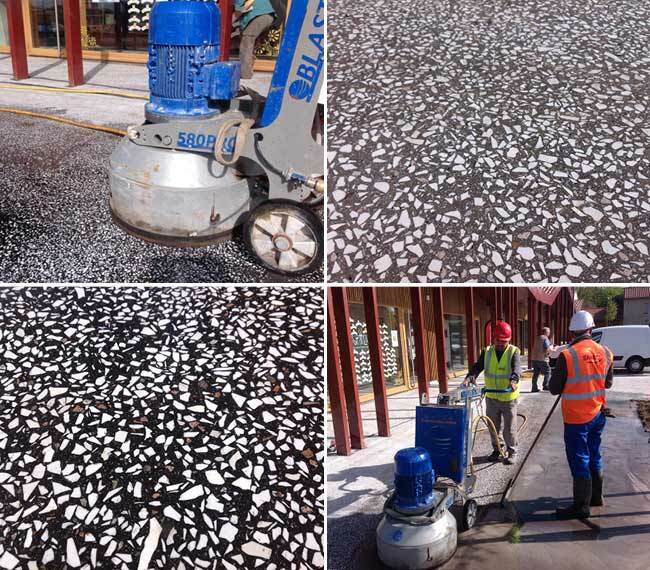 The pedestrian part was carried out with a Blastrac BMG-580PRO triple disc grinder and the driving path with a Blastrac shot blaster 2-20DT. These 2 different techniques create a clear distinction between the 2 areas (colour / appearance / texture). This square was inaugurated on 13th of May 2017 and is named « La Place Charlie », in tribute to the terrible event that took place the 7th of January 2015 in Paris.